This week we introduce Sebastian Fadel to the LHS Student Helpdesk. 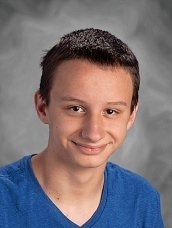 He is a freshman at LHS, and his brother, Gabriel Fadel, is also in the Helpdesk. He is a member of the debate team here at the Lynnfield High School, and is part of a film school in Lynn. He works with other students to make films and learn how to edit professional looking videos. He joined helpdesk because he was interested in helping with technology integration at the high school. He has always been interested in technology, and wanted to use Helpdesk to both learn more and help educate others. What does he want to learn? His favorite part of the Helpdesk so far has been helping out in classrooms, working with students, specifically helping students to better understand the use of technology in class. While a part of Helpdesk, he wishes to learn how to use technology to its fullest extent in an educational setting. Sebastian, unlike his brother, is a PC guy. He believes that Macs are too expensive for what they do and he likes the Windows UI more.